Orlando immigration attorney Nayef Mubarak talks to News 13 about President’s Trump offer regarding DACA protections in exchange for border wall funding. Unable to find an acceptable middle ground on DACA, the faith of millions of undocumented immigrants known as "dreamers" is hanging on the balance. DACA deadline is March 5th. Orlando Immigration Attorney Nayef Mubarak talks to WFTV Channel 9 and comments on the issue. Ibtihal Ibrahim was hoping that she had heard the last of President Donald Trump’s travelban singling out Muslim-majority countrieswhen it was struck down in court. But now that a modified version has gone into effect, she said she is sad that her relatives in Sudan — and people in all six countries — may not have the chance she had to come to America. Attorney Nayef Mubarak talks to Fox 35 News about some of the inconsistencies of the new travel ban set to go into effect March 16, including the removal of Iraq from the list. The new immigration travel ban signed by president Trump is rising concerns. Orlando Immigration Attorney Nayef Mubarak talks to WFTV Channel 9 News about the new Immigration Executive Order. Attorney Nayef Mubarak talks to Cheryn Stone from Channel 13 News and goes In Depth about President Trump's Immigration Policy. Mr. Mubarak talks about the announcement of the increase on the number of border patrol agents, and about new agreements to try to create a broader enforcement agency. 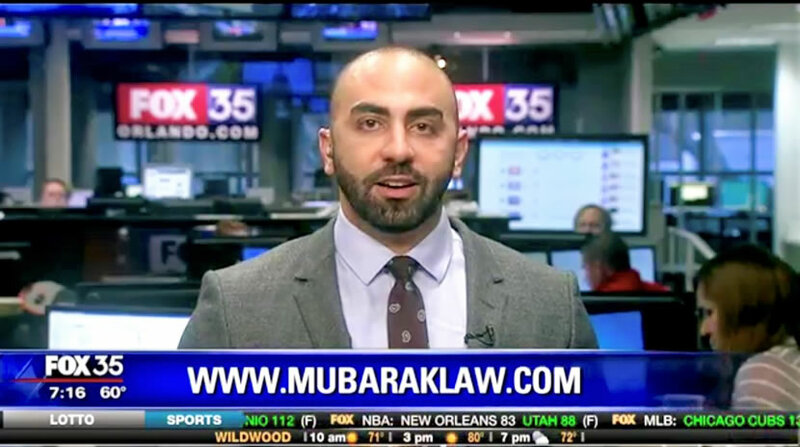 Attorney Nayef Mubarak with Mubarak Law talks to Fox 35 News about President Trump's executive order on immigration and the seven countries affected by the travel ban. The ban has prompted protests around the country. Attorney Nayef Mubarak with Mubarak Law talks to CNN about a Christian couple with valid visas who came to visit their son and were detained for over 8 hours at Orlando International Airport. From the local airports to the port, families were left in limbo this weekend as they waited for their loved ones to be released following President Donald Trump's executive order. Protesters gathered outside of Orlando International Airport Sunday chanting against the ban, while one Iranian woman, Negin Alimohammadi, reunited with her family. Orlando Immigration attorney Nayef Mubarak was there. Nayef Mubarak went In Depth with Channel 13 News about President Trump's executive order suspending immigration from seven Muslim majority countries. Attorney Nayef Mubarak talks to Fox 35 News about the two controversial executive orders on immigration signed by President Trump ordering the construction of the border wall and boosting deportation force. If Donald Trump goes through with his campaign promises, his presidential administration will bring with it a different set of immigration policies. With that in mind, Mubarak Law, a new immigration firm in downtown Orlando, is ready to meet that challenge.